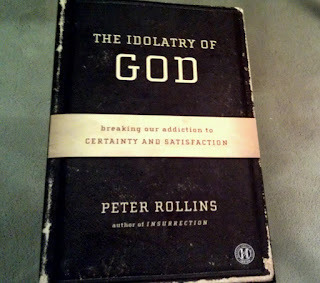 Well, I said I would make some comments about The Idolatry of God by Peter Rollins, so I guess I'll offer some thoughts. "For instead of God being that which fills the gap at the core of our being, we shall soon discover something much more amazing and liberating: namely that the God testified to in Christianity exposes the gap for what it is, obliterates it, and invites us to participate in an utterly different form of life, one that brings us beyond slavery to the Idol" (p.49). 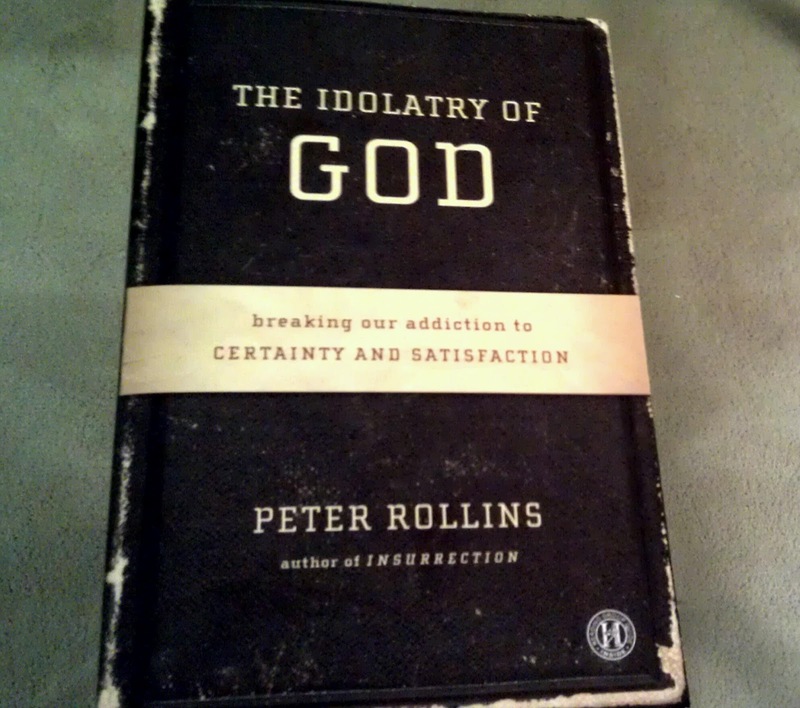 Rather than ending the vicious cycle of Original Sin and Idolatry by satisfying our need, answering our questions, and relieving our suffering--according to Rollins--God ends the cycle by giving us freedom from having to fill a void at all, liberating us from our need to know and be certain of things, and joining us in the midst of our suffering as our companion in forsakenness. This is a good start! Indeed, the good news of the gospel is ironically centered around the cross--the crucifixion of God--in which questions are not answered and pain is not relieved, but the God of resurrection joins us in our pain and opens us up to mystery. "You can't be satisfied. Life is difficult. You Don't know the secret." There is, as Rollins points out, great liberation in being joined by God in uncertainty, the difficulty of life, and the command of mystery. But I'm not sure that Rollins does a good enough job of pointing to resurrection. The Moltmannian tendency that Rollins has of seeing God as our companion in God-forsakenness (see The Crucified God) seems somewhat void of Moltmann's preceding assumption, namely that the resurrection is an eschatological event which, in a way, precedes the cross (see Theology of Hope). In other words, it's not just that God joins us in our suffering, but in a wholly unique and profoundly contradictory way it is the God of resurrection who meets us there. The good news isn't just that we don't have to fill "the gap" but that the cycle is obliterated to total restoration. It's not just that we learn to be free from the structure of sinfulness, but reality itself is indeed to be transformed in conformity to its true future: Christ's future, the resurrection. I'm afraid that, in my reading at least, I missed a clear proclamation and explanation of such a transformation. The book raises lots of theological questions and deals inadequately with several theological issues. Rollins retreats in and out of ambiguity, making bold and somewhat shocking claims that probably didn't really need to be made. Perhaps there's some intentionality in this. Sometimes, especially in pop-theology, you've got to shock people to incite a reaction. Sometimes that's just good writing. But there's a line between creative license and intellectual irresponsibility and Rollins toes that line more than once. I don't think he needed to define "Original Sin" in the way that he did without discussing more traditional models. I don't think he needed to represent the doctrine of Creeatio ex nihilo without properly identifying God--not absence--as the "generative and creative force" (p.10). And I don't think he needed to adopt such an apophatic approach in his description of the nature of God's existence, especially not without engaging its critics. Since this was not an academic work, I would have preferred that Rollins not make theological claims that he didn't have space or audience to develop. But in light of his larger point and given his audience, I can forgive those points of contention. I think Rollins is on his way in the right direction and will lead others in a good direction if they will think critically. The cross is surely central for Rollins. In Jürgen Moltmann's introduction to The Crucified God, he writes, "...only when [people] are reminded of him [Christ crucified]... can they be set free from the power of the facts of the present time, and from the laws and compulsions of history, and be offered a future which will never grow dark again." Jesus Christ's crucifixion is God's refusal to be reduced to an idol, God's refusal to comply to the structures of satisfaction and certainty... and I think that Peter Rollins does well to remind us of him. If I've harped too negatively on this book here, I regret that. I actually want to recommend it! Rollins is a provocative and exciting writer. The Idolatry of God will, without doubt, get your wheels spinning... and spinning toward restoration.